David Watson, Researcher at Watson Farley & Williams LLP, shares his first impressions of the annual Winter Warmer Quiz 2014. 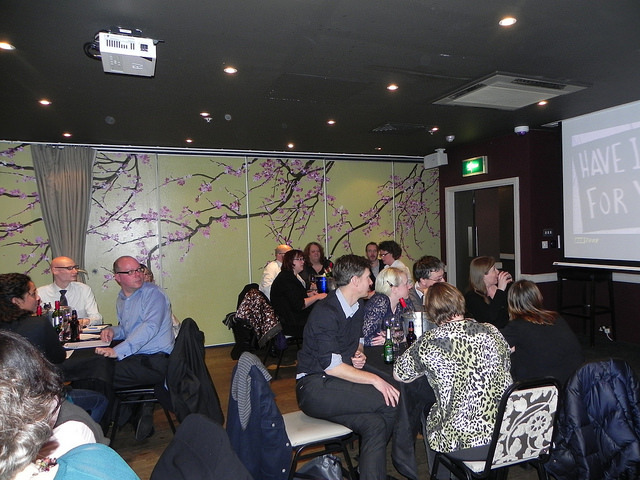 If you attended the Quiz, see if you can find yourself on our Flickr page. The evening of Wednesday the 29th January was, like the rest of this winter, cold dark and miserable – but there was still plenty of cheer to be had, as this was the evening of the annual SLA Winter Warmer Quiz. Dozens of librarians and SLA members congregated in the basement room of a bar in the heart of the City to pit their wits against their professional colleagues. This was the first SLA quiz I had been to and I was slightly nervous – just how competitive was this going to be? Had the other teams all brought ringers? I needn’t have worried as, no doubt helped by the copious wine and beer placed on each team’s table, the evening proceeded with much fun and laughter. There were eight rounds, and to bring a bit of strategy to the evening each team had a ‘joker’, which they could play before any round and double their points that round. Of course it meant you had to guess which round was going to be your best – which our team anyway did not manage to guess correctly. The ‘faces of the year’ round was particularly tricky! The competition was closely fought, with many teams within striking distance of the lead throughout the evening. In the end Dewey and the Decimals won deserved victory, with Team News close behind. 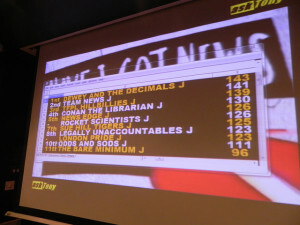 My team, The Legally Unaccountables, alas came 8th. There was a good mix of professionals from across the SLA, from media librarians, accounting librarians and legal librarians, to information sector recruiters. After the quiz had wrapped up many attendees remained for a while to catch up and network – and finish off the wine and beer that remained. Getting to #SLA2014 – Chemical Division’s Sparks Award Call for Applications!